Who controls the history of a people controls the people. Colonization of the land is easier to fight than colonization of the mind. Who gets to define Hinduism today? Should they? For those who have, what's their agenda, their motives? For those who support, what drives them? Academia in the United States has a well-deserved reputation for independence, and exercises far greater intellectual honesty - for the most part - than compared to, say, many of the leftist-controlled institutions in India. This streak of honesty breaks down, however, when it comes to Indology, and especially Hinduism studies. Almost without exception, Hinduism as a subject in US academia has for decades been in the control of the racists, the xenophobes, the bigots, the supremacists, and at times the outright insane! Like the person who insisted in an "acclaimed" book that "most of India" lay in the Northern Hemisphere (for the record, and this is not a matter of opinion - all of India is entirely within the Northern Hemisphere; not "most", but every square-inch. In fact, the southernmost tip of India - Kanyakumari - is a good 800 kilometers north of the Equator, and has been that way for at least the last 15 million years)!!! Vamsee Juluri's book, "Rearming Hinduism", is an intellectual tour de-force; a contemplative work where you are likely to go back and re-read pages to derive a greater appreciation of . In many ways, the book forces you to think about the import of what's implied. In the small but growing literature on reclaiming Hinduism from the Hinduphobes, this book is a welcome addition. Give this book a read. Understanding Hinduphobia in western academia is a difficult task at best. Simplistic generalizations may act as a temporary palliative for the anger and hurt that their writings arouse, but they neither inform nor equip us to fight back effectively. Worse, they lead us into a permanently reactive mode, forever doomed to lose a battle where the rules of engagement are allowed to be set by the Hinduphobes. Fighting this battle is not an easy task, since "Hinduphobia has five hundred years of privilege that gives it a monopoly on the press and the academy, and a tremendous influence over our own postcolonial educational system and intellectual class as well." One need look no farther than our first prime minister, Pandit Jawaharlal Nehru, to see what lasting damage a colonized mind can inflict upon the cultural fabric of a nation. "Hinduphobia has five hundred years of privilege that gives it a monopoly on the press and the academy, and a tremendous influence over our own postcolonial educational system and intellectual class as well." The roots of Hinduphobia lie, unsurprisingly, in the "leftist takeover of the academy and the social sciences" in the United States. While the putative benefits of such a takeover were "diversity and empowerment", when applied to Hinduism, however, it became impossible to be "conservative and Hindu in academia." White guilt over slavery and colonization was transferred on to Hinduism, with all the baggage of racism, casteism, and fundamentalism. The right of the Hindu to represent himself and his religion at this high-table of academia was taken away - we were ipso-facto incapable of being intellectually honest. For a long time, the uncontested narrative was that of a racially superior race "civilizing" the natives of dark lands, of converting - in more ways than one - savage races steeped in violence and primitive animal sacrifice to a higher, nobler ideal. When the European colonizers in the Indian subcontinent came across a more advanced and uncontestably superior civilization, history had to be rewritten - or created - as necessary. Therefore, what the Hindus invented in Maths - like the decimal number system and zero among many, many other things - was credited more to the Arabs and later completely secularized (there were even suggestions that it were the Greeks that may have discovered the concept of zero, and that this discovery traveled to India only much later); while what was good in science - astronomy for example - was dated to a time well after those discoveries had been made in the west. The Vedas were undeniably more advanced works - literary as well as philosophical - than anything the European colonizer had at home or had come across. The credit for these scriptures was thus lain at the door of the Aryans, who in turn were presumed to have brought their superior civilization to the subcontinent, and along with it the Vedas - the holiest scriptures of the Hindus. But this appropriation was only the first step. The next was to systematically distort and demonize everything that could be conceivably termed as good in the Vedas - "The Vedas were words that were chanted when animals (and sometimes humans) were being killed. There is also a corollary claim now from this school of theorizing: the Vedas were also about killing and eating cows." "There are two reasons for the persistence of the myth of Vedic violence. At one level, it is geopolitical. It is the old colonizer's myth about the superstitious natives, steeped in brutality and in need of civilizing forces, such as either a colonial religion or secular rule of law." The outlandishness of some of the claims of the Hinduphobes would elicit peals of laughter were they to be examined closely. It was declared that what was bad in Hinduism - in spite its foreign origins - was the result of the corrupting influence of the Indian climate which caused them to have "grown dark and dull in the sun." (For example, Abraham Eraly, an Indian Hinduphobe, employs this line - hook and sinker - in at least one of his books - "The Age of Wrath") Colonists carried perhaps a deep memory of their own experiences that coloured their world view. The monsoons, so beloved and cherished and celebrated in India, when viewed from the colonist's eyes, became the cause of imagined "violence" in Hinduism because they signified "uncertainty"! A presumed "normativity of violence" led to the "myth of Vedic violence". "From Darwinian survivalism to the naturalization of violence is a small step. If we extend our scope now to violence in the media and pop culture, if we look at the story that all our movies, TV shows, videogames, books, and comics are putting out about violence, we can see how pervasive and widespread the naturalization of violence is today." Vivisection is but one such manifestation of this casual insensitivity for life-forms deemed inferior to one's own kind. "What vivisection is really teaching us is not biology but an ideology; call it speciesism, necrophilia, scientism, Darwinist fatalism. In the end, it teaches millions of children that the suffering of a living being is inconsequential. It teaches them to harden their hearts, dehumanize themselves, and unnaturalize themselves, all in the great cause of science." The unremitting nature of these falsehoods and deceptions can perhaps be traced to the need to attribute success and progress to an innate superiority of the European, of the occidental over the orient, of the white over the black, the brown, the yellow. It has been well-established that England got a leg up on the rest of Europe on the Industrial Revolution, thanks to the loot it plundered from India after the Battle of Plassey in 1757. Vamsee speculates that "It is surely more than a coincidence that they got over their dark ages and had their Enlightenment just around the time they met us, but we don't hear much about that at all." The brilliance of the colonials in whitewashing history to fit their Euro-centric supremacist narrative would lead one to suspect that this is more probable than what a "coincidence" would imply! 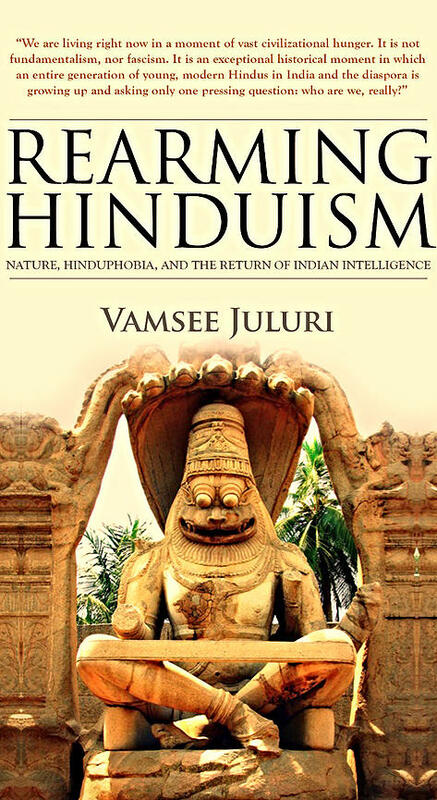 What the first half of Vamsee Juluri's book also did, at least for me, was to look at all the different lines of attack by the Hinduphobic cabal and discern a common underlying theme - hidden albeit - that had hitherto escaped me. It is not just academic hubris that can singly explain the vehemence of the Hinduphobes in insisting upon the immutability of the Aryan Invasion Theory. Upon this one myth rests an entire edifice of racism, bigotry, and Hinduphobia. Yes, the need to establish the primacy of the west as the superior, conquering race is one raison d'etre. But tied to the Aryan invasion theory however is the much larger agenda to prove the subservience of all of Hindu thought, creativity, and nativity to foreign ideas. The convenient but false chronology that the Aryan Invasion Theory provides is a vital linchpin therefore. "But an even more brazen denial of Hindu agency, this time of women, takes place in Doniger's mythic opus. If the Mahabharatha had a fierce, independent heroine (as opposed to a passive one in the Ramayana's Sita), Doniger writes, it was probably because the bards were impressed and inspired by the fierce and independent Greek women who came by to India at that time. Anything, even Aphrodite and Athena, can be dragged into this now, just to evade the reality that there might be some Hindu women who were fierce and independent too. This too is a common orientalist trope, an old racist colonial myth about the dynamics between white women and people of color." Rather than acknowledge that Indian women might have been independent and strong-willed themselves, a reality too many people know only too well, our experts tell us to salute the independence of the foreign women who inspired Draupadi. The dusky Indian sexist male, after all, can only picture a strong woman when she comes from the civilizing West." Similarly, the argument that there was "no Ram in reality and that the Ramayana is a work of fiction" is only one line of attack, meant more to divert attention from the other, more insidious attack - "that the ideal of Ram Rajya was really a reflection of Ashoka's rule because the Ramayana was composed around that time." And on and on it goes - the relentless attacks of the Hinduphobes and its associated clique. So what does Hinduism really teach? Hinduism talks about one God, yet "without insisting there is only one God. We also speak of 330 million gods." While there are many interpretations of that number, "The one I like best says that there were 330 million people on earth when that phrase was coined. It just means each one is a part of God..."
While the first part of the book attempts to uncover the origins and psychology of the Hinduphobic academic gang in the west - and for my money is brilliant in every sense of the word - the second part of the book is more a celebration of Hinduism, of the diversity that exists in the faith that seems the divine even in animals, where gods are seen not as mere gods but as friends, guides, companions, as children. In "rearming Hinduism", the desire is in disarming "the ignorance that causes harm in this world." This message is in the (last) chapter that was written from Kashi in May 2014 - a momentous time in India's history, or as the author writes - "We have desa and kala on our side again." A journey that took its first step in May 1998 took a giant stride in May 2014. Disclosure: I wish record my thanks to Indic Academy for a paperback edition of this book. This review was first published in IndiaFacts on August 21st, 2015.